Companies who are booking accommodation for staff members can make a considerable saving by using luxury serviced apartments in London. Let’s suppose that you have two members of staff who you are sending to the city for a month, or even longer, as they are working on a contract or need to visit several customers. If you can find a two bedroom serviced apartment it will be far cheaper than booking two separate four star hotel rooms which is really the other only alternative. Your two staff members can easily share the apartment, and not only that, they will be far happier than living out of a suitcase in a hotel room for a month. That also means that they will be more productive, because staying long term in a hotel can be very depressing for some people. In a serviced apartment they can live on their own terms, have guests round, and even entertain clients. There are other savings, too. Staff will cook their own food rather than going out to eat all the time, whereas the cost of eating in a hotel restaurant in London is rarely anything short of astronomical. They can also save on laundry because a serviced apartment such as those in Carlton Court will provide a washing machine and tumble dryer in the kitchen, whereas hotel laundry is once again incredibly expensive. 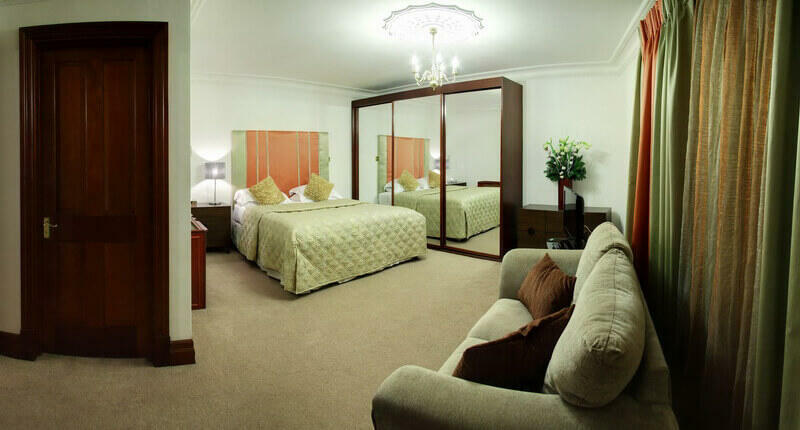 Our serviced apartments in Carlton Court also provide everything that the visitor is going to require, including TV’s in every room, king size beds, 24 hour concierge and security service, seven days a week maid service to make the beds and clean the apartment, and a lot of other benefits as well. We even provide visitors with a breakfast hamper every day with a choice of teas, coffee, milk, fruit juices, a selection of cereals, fresh bread, fresh pastries – croissants, muffins etc. – butter, jam, marmalade, and honey, and fresh eggs. All of this is included in our basic charge. The only extras are for phone calls (for which you receive an itemised bill) and airport pickup if required.